"The idea is, there's going to be challenges along the way, but the ultimate goal is to chase your dreams," Shae Petersen says of "Atlas." To Shae Petersen, his artistic alter ego SRIL (pronounced “surreal”) is as much a feeling as it is a name or means of classifying his artwork. "I never thought I could do this for a living," the surrealist aerosol artist says inside a dark garage, shielding his body from the sun's harsh gaze before he has to get back to work on his latest monumental work. Petersen started experimenting with graffiti lettering when he was 11, but eventually slowed down to focus on a graphic design career. 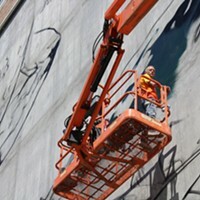 He re-committed to doing graffiti pieces in 2007, then moved onto more artistically ambitious portraits around 2012. 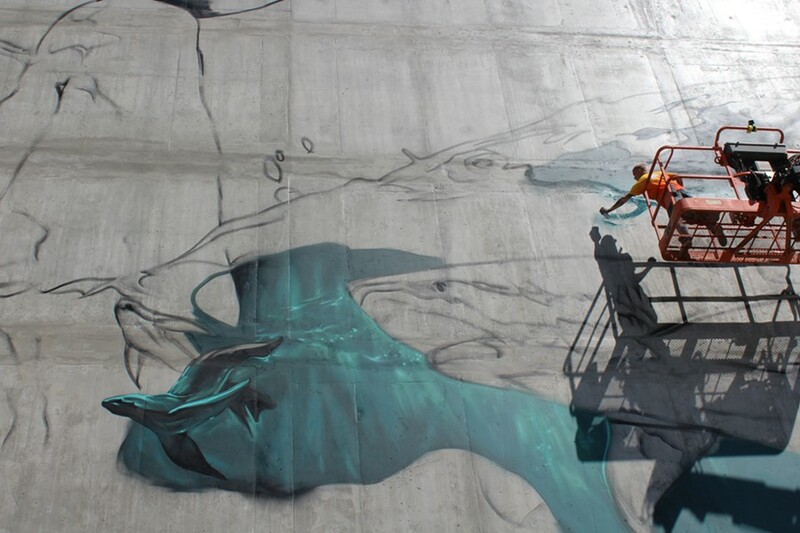 For the next several years, he kept creating public and private works part-time. "It was extremely nerve-wracking," Petersen says. "I had just bought a house in Las Vegas. I've got a family, I've got bills just like everyone else." Now living as a full-time artist, Petersen reflects on the odds that were stacked against him during his start. 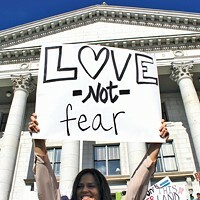 "Being an artist and doing what I do in Salt Lake is difficult. There's not very many people who can make a living as an artist, first of all, second of all as an aerosol artist," he says. "It was always kind of a goal, and in the last couple years, I've achieved it." Petersen's latest mural, titled "Atlas," has personal significance because it reminds him of that climb. 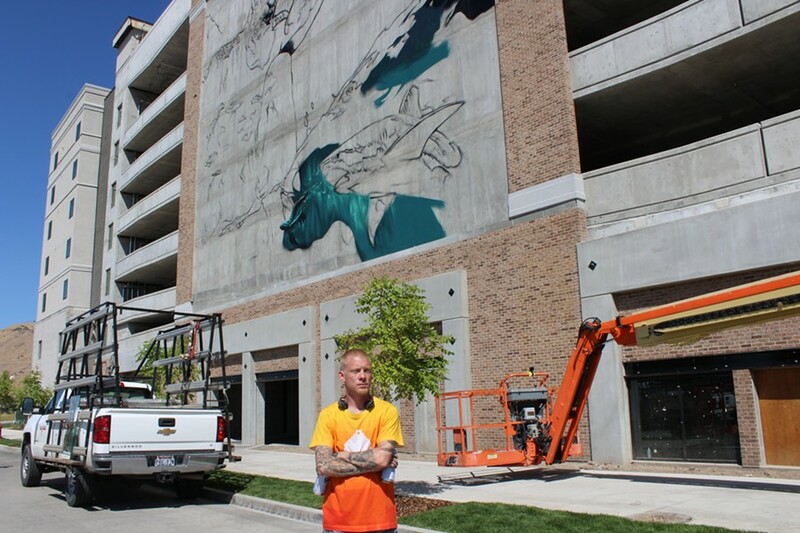 Located just east of the Utah Transit Authority's North Temple Station, the vibrantly colored, nearly 4,000-square-foot public display will adorn an otherwise gray wall on the side of a luxury apartment building. The project is a big get for the artist, a composition he thinks will be the biggest of its kind in Utah. "Previous public murals, it was me offering my time. Or basically kind of hustling the wall. Almost kind of begging for a place to paint," he says. "And now, this is a large, significant mural that I was commissioned to do." In the piece, Atlas, the mythological titan condemned by Zeus to hold up the sky for eternity, stands partially submerged in water, struggling to keep the weight of the heavens over his head as a shark lurks nearby. "For me, it basically means capturing your dreams, or chasing them," Petersen says before identifying its inspiration: a lengthy quote from Atlas Shrugged, a politically polarizing novel written by Ayn Rand that serves as a bible for many conservative and libertarian thinkers. "Our owners just love that book," Jenna Slaughter, project manager at Salt Development, says of its themes and emphasis on American industrialism. Hoping to spice up a wall on their Hardware Village West building, the company pitched Petersen a Rand quote after recognizing some of the artist's public works. Slaughter says she regularly sees Petersen's "Godlike"—another massive work that depicts mythological lore, located near 3300 South and 300 West—when she drops off her dog at a pet daycare center. "As soon as I made that connection, I thought, 'Oh my gosh, we have to have him,'" she says. Petersen toured the building at 455 West 200 North, taking note of its refined industrial feel. He recalled his own professional trajectory after reading the short passage from Atlas Shrugged—several sentences about the importance of keeping the creative spark alive and not letting "the hero in your soul perish in lonely frustration" after failing to achieve your dreams. "It was just perfect. It kind of sparked something in me," Petersen says. He hasn't read the book, but he's aware it's a point of contention for some. Jeremy Rosen, assistant professor in the University of Utah's English department, says the themes in Shrugged revolve around the virtues of hard work and individualism. In Rosen's telling, Rand's novel is an attack on the government's regulation of businesses, arguing that captains of industry pursuing their own self interests benefits society as a whole. "My hot-take is that message has some seriously destructive consequences," Rosen says, mentioning the 2008 financial crisis and environmental catastrophes traced back to big business. Plus, Rosen adds, the book's message fails to take into account the unevenness of the American playing field. "It imagines that having a dream and trying to realize it, and individual effort, is the only thing holding us back from living our dreams," he says. "It ignores that for lots of people, people who grew up in poverty, people of color, women, for much of our history, have not had the opportunity to realize their dreams." With that analysis in mind, Rosen says paying homage to Atlas Shrugged on the exterior of a luxury apartment building—Slaughter says monthly rent for a studio starts around $1,500—validates the idea that the wealthy tenants who live there achieved success all on their own, and that society owes them something. "I would stress that it also suggests that people who can't afford such luxury living also deserve what they get, and therefore ignores the way in which structural inequality are often responsible for their impoverished living conditions," he says. "It's not surprising. But frankly, it's rather offensive." Petersen doesn't see the connection between the mural and Rosen's critiques. "For me, the piece of art is public. It has nothing to do with the people who live here and who don't," he says. He also believes in the general message behind the rendering. "My personal experience is, hard work does achieve your dreams," he says. "I mean, it's not a given, but persistence is important." 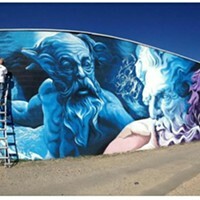 Citing some of his other public pieces scattered throughout cities like Las Vegas and Denver, the artist—who last year had a planned mural on a wall of the Exotic Kitty gentlemen's club nixed by the city of South Salt Lake—says his job is to create something visually striking, not become involved in the controversy that could surround a particular subject. "I've painted things based on Neptune, or I've painted Breaking Bad, that wasn't me, you know, selling drugs or anything like that. It's pop culture and ultimately, what I want to create is something that didn't exist before that hopefully brightens someone's day," he says. Petersen's take on his new project aside, he'd prefer viewers come away with their own interpretations. One of his main drives, he says, is the democratization of meaningful, good public art in Utah, which broadens people's artistic literacy. "I don't think it should be something that's just limited to galleries," he says. "Whether or not you have money, I think this type of art is important for everyone to see and appreciate, and how they interpret it is entirely up to them."